In a recent Vegas Seven article titled “Silver State, Green Energy“, writer Nicole Ely tells why Nevada remains a promised land for the alternative-energy sector. In Boulder City, this is one of Nevada’s largest solar installations, with capacity to power 14,400 homes, according to the National Renewable Energy Laboratory. With the former completed in 2012 and the latter still in construction, these combined solar plants will generate enough energy for 142,000 homes when completed. This utility-scale project is currently in the works in Nye County and will be online this year. 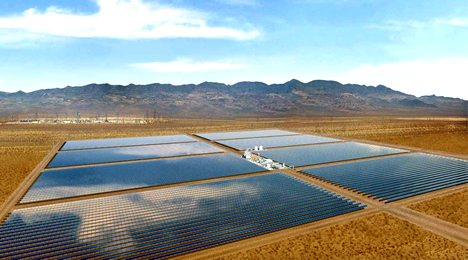 With 110 megawatts of solar power, Crescent Dunes will power 75,000 homes. This 152-megawatt plant in White Pine County is Nevada’s first utility-scale operation for wind energy. The project’s 66 2.3-megawatt turbines provide NV Energy with electricity under a long-term power purchase agreement. Clean Energy in January and still inching through the permitting process, Seachlight will generate 200 megawatts of electricity with 87 turbines churning away on 160 acres of Clark County land near Harry Reid’s hometown. With 32 plants, Nevada produces more geothermal energy than any other state except California. Read the full article on Vegas Seven’s website here.